What are the Multiplication Properties of 0 and -1? 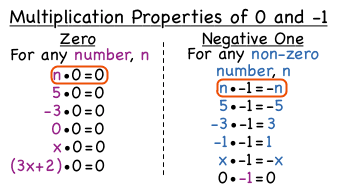 Understanding the multiplication properties of 0 and -1 are fundamental building blocks in learning all there is to know about the operation of multiplication. In this tutorial, you'll learn about these two important properties. What are the Identity Properties of Addition and Multiplication? Let's identify an identity! Addition and subtraction have a different identity than multiplication and division. Learn about each of these identities with this tutorial!